The training plan I’m (vaguely) following, from Your First Triathlon by Joel Friel, puts all of its strength training days as optional, on days that are otherwise rest days. So on Mondays, it’s either take a rest day, or do some strength if you’re feeling up to it. So far I’ve felt up to it exactly one time. I find weights pretty boring and uncomfortable, and would much rather be outside. Rest days have also proved to be pretty important, so there’s not much motivation for me to pump any iron so far. That said, I recognize the need to improve strength in order to be able to achieve the fitness required for triathlons. For me personally, I need strength in my core to balance out a genetically poor back, and upper body strength for swimming. Instead of weights, I have combined a bunch of things into one by focusing on mountain biking for about half of my bike workouts. I happen to live very close to an epic MTB trail system, so I can get out there very easily. It’s not something I have a lot of experience with, but the experience of training in different modes is proving to be pretty enjoyable. Mountain biking is a much different workout than road biking for me, particularly as I’m new to it so I’m still fighting to stay smooth. That results in a lot of muscular activity in places that I wouldn’t normally experience while hammering it out on the asphalt, like in the arms and abs. At the same time, it gets my heart rate up consistently and works on explosive power in the legs, so it’s kind of the best of all worlds. It’s not exactly the same as a dedicated strength workout, of course, but at this point it’s covering what I need for sure. The downside is that it’s rougher on my body. 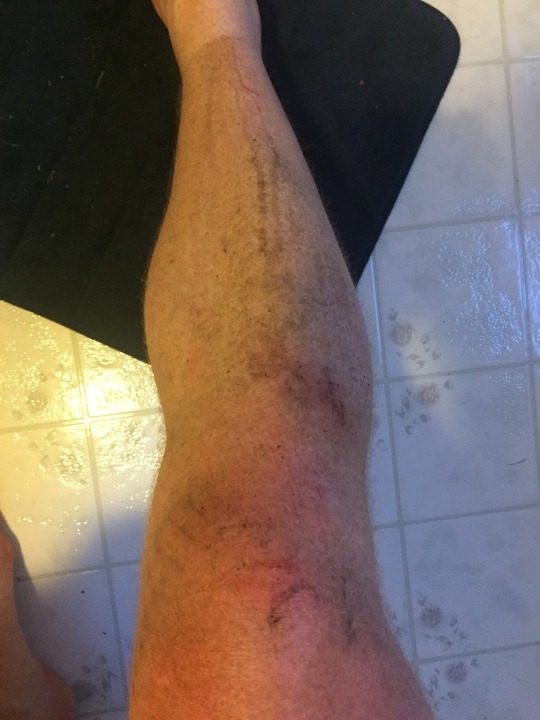 I come home from an MTB sore in places that I didn’t even know existed. I scrape my shoulders on trees and rocks, jam my feet, cramp my hands, get covered in dirt and grease and all kinds of things, not to mention the bugs. But it’s great muddy fun.